South East BC Breweries… Something all bikers and skiers should know about! Mmmm…. Beer, as Homer Simpson says.. I’m no alcoholic but I do love a good local brew. Especially after a great day of skiing, or mountain biking, or hiking, or fishing, or whatever you are into doing outside. South Eastern (SE) BC offers some the worlds, yes I said worlds, best skiing, mountain biking, fishing, etc….. and Micro Breweries. If you live in, or have visited any of the towns listed below you know what I’m talking about. With Micro Breweries all over North America now, beer drinkers have been able to enjoy fresh, flavorful, organic, etc… beers made right in their back yard. As you may know, I’m fortunate enough to live in Kimberley BC and have enjoyed not only the great skiing and mountain biking but also having our own Micro Brewery right here in town. We here at BikeNski.com have been travelling around SE BC skiing and riding and visiting all the great Micro Brews offered in SE BC. Below is a list of the breweries we’ve found along with a quick overview of them. Most of these Breweries offer a tasting room, swag, and a delicious offering of their brews. So, have a read and when you are travelling through, visiting on a ski trip/bike trip and have enjoyed and epic day, make sure you stop into these great micro breweries for a pint or two. It will put an exclamation mark on your already amazing day in SE BC. Let’s start with my home town, Kimberley. Overtime Beer Works started a few years ago here in Kimberley BC and I must say, without too much bias, they are brewing some fantastic brews. I’m personally a Pale Ale or IPA guy, but am slowly starting to enjoy the darker, heavier beers.. Maybe it comes with age. Located right down town Kimberley near the Platzl, Overtime has a great tasting room where you can sample all of their flavors or just enjoy your favorite. Overtime is sold in BC Liquor stores and in Alberta. They have off sales at the brewery and I don’t know why but when you buy beer directly from the brewery it always taste better. This is a great place to stop in after a ride, ski, or whatever you like to do and relax with a cold one. I’m going to head east from Kimberley to a very well known ski destination (one of my favorites), Fernie, BC. Fernie Brewing Company has established itself as one of the premier micro breweries in BC. Just east on the highway from the town of Fernie, right off the highway, you’ll find this very modern/rustic brewery with a great tasting room and swag to buy. I’ve have been a few times myself and can say it is definitely worth the stop if you are in the area and happen to like beer. I’ve attached a nice little video from their website below. I need say no more. Just make sure you stop by. From here we’ll head back north an hour or so and stop in Invermere BC. Again, just off the highway at the industrial park you’ll find possibly my favorite India Session Ale at Arrowhead Brewing Company. With a very cool, and unique tasting room Arrowhead is must visit for those hitting the Invermere area. “I’ve been thinking about getting the band back together” is quite possible one of my favorite brews to date. I make a point of visiting this brewery every time we ride the great trails in and around Invermere. The Arrowhead tasting room is very cool. It has a rustic/retro kind of feel. It’s very cozy with swag to buy and of course delicious fresh brews for your pleasure. Check out our post on riding in Invermere. When you do go visit let them know we told you to go there by. Well continuing north for another hour or so you’ll roll right into beautiful Golden BC. Home of my favorite Kicking Horse Resort , awesome mountain biking, and of course, Whitetooth Brewing Company. Located right in town, Whitetooth derives from the original name of the ski hill in Golden. Whitetooth has a great tasting room with an awesome outdoor patio/firepit area all year round to enjoy your favorite brews with the amazing views. Ride right on in after finishing your favorite trail or pop by for some apres after ripping some pow at the hill.. Either way you’ll be sure to enjoy the great flavors on tap. I’m heading back in April for some of this deliciousness, oh, and some skiing too. And just like all the great micro breweries, you can get some lovely swag too.. So we head west now to the next little ski town, which you may have heard of, Revelstoke. And yes, the stoke is high and the beer is yummy.. Local Brewery, Mt. Begbie Brewing Company, does an excellent job of not only brewing great beer but offering some tasty treats in their tasting room and…. brewery tours!!!! Because we all love brewery tours.. Mt Begbie has a great array of flavors with their Power House Pale Ale being amongst my favorites. You can never go wrong spending some time in Revelstoke with their world class skiing at Revelstoke Mountain Resort or riding their top notch trails in the summer, or hiking, or golfing, etc…. you get the point. But one way to definitely improve your time in Revy is to visit Mt. Begbie Brewing Company, you won’t be disappointed. Heading south along the scenic Columbia Lake, Slocan Lake, and Kootenay River for about 4 hrs, you’ll eventually end up in beautiful Nelson BC. After the long drive and sensational scenery, there is no better place to grab a cold one than.. you guessed it, Nelson Brewing Company. Nelson is a mountain bikers and skiers dream with some steep technical bike trails to test all abilities. and the powder filled Whitewater Ski Resort. But I believe Nelson is also becoming well know for their beer at the Nelson Brewing Company(NBC). NBC is all about using organic, sustainable ingredients in their beer. I know the word “organic” is thrown around a lot but, I believe it is great practice as a company and has resulted in outstanding tasting beers. The Happy Camper Organic Summer Ale, and Faceplant Organic Winter Ale are amongst my two favorites in their lineup. NBC has a great tasting room with lots of swag to let your friends know you were there. If you are going to Nelson hit NBC. If you are not going to Nelson, go, and hit NBC..
Just an hour south of Nelson you’ll rise up out of Trail into the very quaint ski town of Rossland, home of the Red Mountain Resort. Rossland is known for some of the best mountain biking in BC as well. Right in town on the main drag you’ll find another very cool reason to visit Rossland, the Rossland Beer Company. Of all the Breweries we visited, Rossland was the only one you couldn’t buy off sales of cans or bottles, but you can buy growlers.. We were there in January and the place was happening. You had to wait in line to get in. Not ideal in winter but well worth it. For me, this is probably the best place in town to grab a cold one. Not just because of the atmosphere inside but the great tasting brews. They don’t have as big of a selection as most of the other breweries mentioned but they do have a flavor for everyone and those flavors are great.. My favorite is the Paydirt Pale Ale.. Winter or summer, ski or ride, it doesn’t matter just make sure you end your epic day in Rossland with the Rossland Beer Co.
Just east of Rossland on the Columbia River you will find Castlegar. You won’t find any breweries there….. yet!! Tailout Brewing is set to open this summer, 2019. According to their website they’ll be starting with an IPA, Red Ale, Pale Ale, and Lager and they will have a tasting room, phew. Castlegar has been building some great mountain bike trails, is close to Whitewater and Red Mountain, and sits on the Columbia river with some amazing fishing. You’ll see on their site that the boys are into fishing.. We’ll have to float them some bike n ski pics to flash it up!! I’m always excited to see a new micro brewery open and will definitely stop by when we hit that area for some riding this summer. As you travel east over the Kootenay Pass you’ll roll right into Creston BC.. Now I don’t really consider this a local brewery anymore as it is owned by Labatt but, the Columbia Brewery is a landmark in town. Columbia Brewery began in 1959 and was purchased by Labatt in 1974. They produced the famous Kokanee Lager while also producing Alexander Keith’s, Brava, Budweiser, Bushch, Kootenay Ale, Labatt, Lucky Lager, Wildcat, and Winchester.. They do large scale canning and kegs at this location as well. They have a tasting room, food, brewery tours, and swag.. I’ve actually never visited this location, I guess because I generally like the smaller local breweries. As you travel east again for about an hour and a half you end up in Cranbrook BC, just down the road from Kimberley. 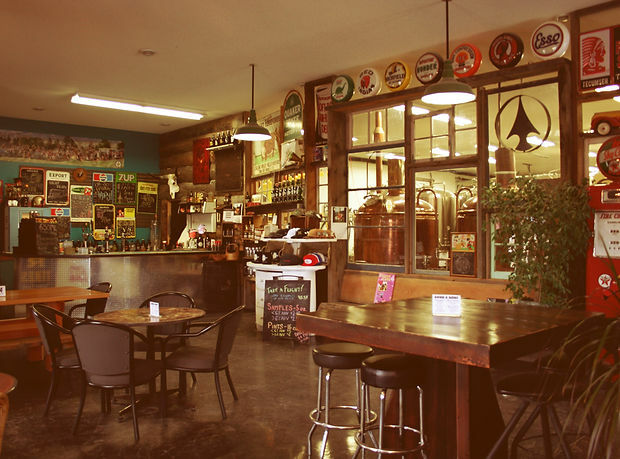 Cranbrook is home to Fisher Peak Brewing Company. Fisher Peak is located right down town Cranbrook in conjunction with the Hiedout Restaurant. This is a bit more of formal restaurant/pub style location but does have a bar area to sit at. I’ve only eaten there once and the food was good, not great, but good. The beer was very nice. I personally enjoyed their IPA. If you’re in Cranbrook riding your bike, they do have great bike trails, and looking for a good place to eat or have a pint, or both, stop by the Hiedout for some grub and Fisher Peak brews.. This takes us back to Kimberley just 20 minutes up the road. I can’t tell you how lucky I am to live in this amazing area of the Province. As mentioned above, the skiing around here has been dubbed as the Powder Highway. The mountain biking is endless world class trails with tones of money and volunteer hours being pumped into all these small town’s trail systems. We have a few posts about riding around here already and will be adding lots more this summer. So if you’re like us and love to travel around skiing different places, riding different trails, and ending these epic days with a cold one, make sure you stop in and try these local brews…. you won’t be disappointed. World class skiing, World class biking, and World class breweries… all in Southeastern BC.